Dragon boaters welcomed Saturday’s rain, despite it putting a damper on the eighth annual Steveston Dragon Boat Festival. “Yes, it was miserable and cold, and not pleasant, but given what was going on with the forest fires (in the province), it was a blessing to have that rain,” said Allison Miller, co-manager of Twisted Dragons, a team of men and women over the age of 55. 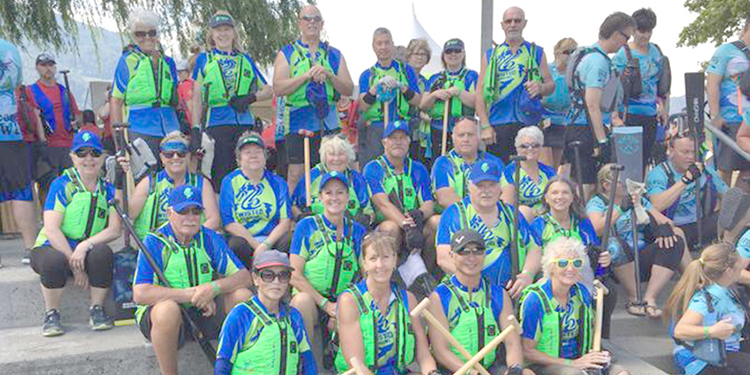 David Chinn, operations manager for Dragon Boat BC, said a record 78 teams participated in the sold-out competition, which featured 2,100 paddlers and some 10,000 spectators. With the youngest competitor being 15, and others in their 80s and 90s, Chinn said teams assemble each year for a variety of reasons. Some are breast cancer survivors, others are mental health groups, and there’s even a team for the Richmond Food Bank, Chinn said. “There’s really a team out there for everybody,” said Chinn, who said that although this season is now winding down, work is already underway planning next year’s competition. For the Twisted Dragons, which formed in 2009 when the BC Senior Games were held in Steveston, the 31-member team practices twice a week, 90 minutes each time, from March to the end of September. Some members join other teams to even practice weekly during the winter months. For the Twisted Dragons, the philosophy is to try to incorporate fun, fitness and competition into everything they do. The cost of joining the team is “very reasonable”, Miller said, when you consider the length of the season and the number of practices. Chinn said anybody who is interested in dragon boating should reach out to Dragon Boat BC. “There’s really a team out there for everybody,” he said, no matter the age, skill or fitness level, or how competitive they wish to be. There’s a cap on the number of boats that can participate, Chinn said, and the Steveston event sells out early each year. Over the past eight years, the event has become a regular part of the Steveston scene.